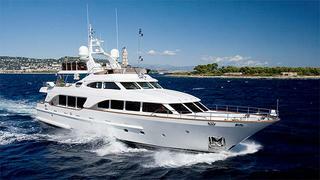 Jan-Jaap Minnema at Fraser Yachts tells me that he's now signed the 30.2m motor yacht Jazz of Monaco for sale. Built by Benetti in 2007 to ABS class, Jazz of Monaco is one of the yard's Tradition series designed by Stefano Righini. A relaxed interior by Francois Zuretti accommodates eight guests in four staterooms including a full beam master suite on the main deck while twin 1000hp Caterpillar engines give her a range of 2,100 nautical miles at 10 knots. Jan-Jaap says that, rather engage in a series of price cuts, he's brought Jazz of Monaco to the market as the best-priced Tradition worldwide, asking €4.9 million.